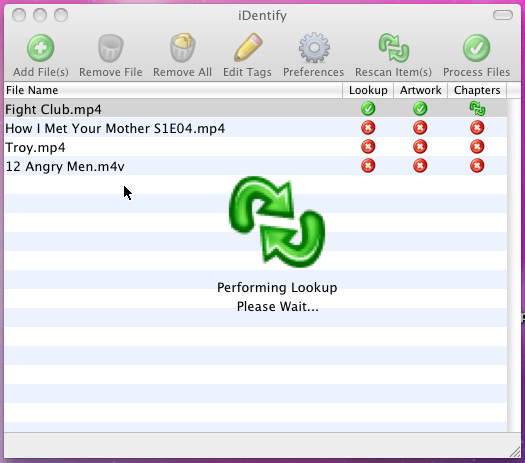 A OS X application for tagging iTunes compatible MP4 video files, iDentify 2 automatically grabs the tag info from the web for you. 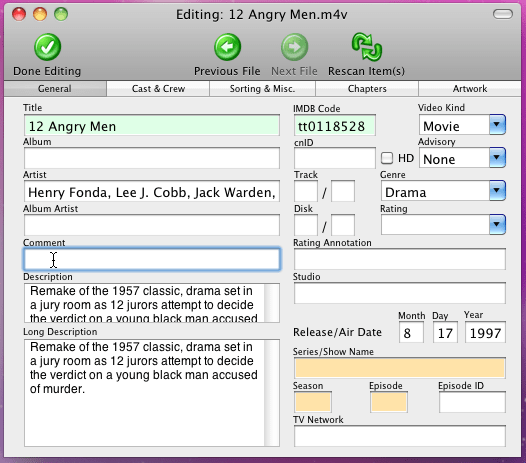 Ever have to import or convert a movie to your computer for an iOS device? Then I am sure you have noticed that after converting media files, all the associated tag information was deleted. The tag information is the Title, Artist, Description, Movie Type, etc., and this information is important when you want to keep an organized library which also makes it easier to search for these files. iOS devices also read the tag information and not the original filenames. As far audio files (mp3’s, wma’s, etc.) are concerned, there are tons of tools available to quickly tag them, but what about iOS supported videos files in MP4 and M4V format? 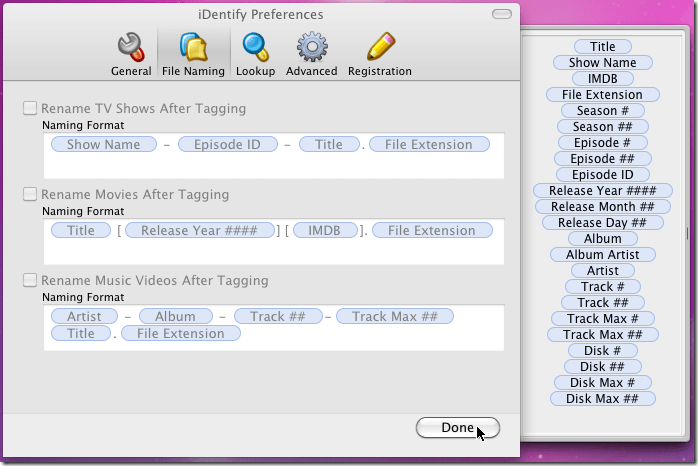 iDentify 2 allows you to quickly tag iTunes compatible video file formats. Whether it is movies, TV show episodes, or plain music video files that you want to tag, it can add information to almost any kind of video by fetching information from online sources, like TheMovieDB, TVDB, and tagChimp. Furthermore, it supports the Growl notification system, so you can keep tab on the tagging process and get a live update on how many files have been tagged during the process. The application is designed to be simple and straight-forward. All that is required is to drag video files over the main window. Once dragged and dropped, it will instantly start to looking up for information from online sources mentioned above. Once this information is pulled out, check out the status under Lookup, Artwork, and, Chapters columns. To add more information which the search did not bring up, simply double-click the file in the list to fill-in the empty fields. When you’re all finished with your modifications just click on the ‘Process Files’ button finalize the meta-tag information and album cover art. iDentify 2 is vastly configurable. You can tweak it with file naming conventions, enable/disable online sources, and other lookup options from Preferences window. The iDentify 2 developer has told us it has been submitted to the Mac App Store and is currently waiting approval until then you can download it from MacUpdates. It is available for free and works on Mac OS X 10.4, 10.5 and 10.6. How can i autotag files based on filenames?